Universally applicable, floating, high-voltage power supply with built-in, high voltage resistant transformer to supply the heater voltage for electron tubes. 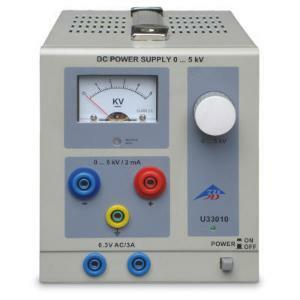 Continuously adjustable high voltage, safe to touch, with passive current limitation and analog voltage display. Unit poles can be connected to protected earth, but it is not center tapped.